Pam, a 52-year old flight steward was so tired of not being able to read paperwork, including boarding cards because of the usual long-sightedness that develops in middle age that she decided to opt for laser treatment. “Reading glasses are perfect if all you do is sit down and read. I was constantly on the go and was totally fed up with putting my glasses down and forgetting where they were. I tried having them round my neck, but they would catch on things and were not exactly in line with aircraft safety,” she laughs. Although she could have had an eye laser treatment in the UK, she hesitated because of the cost. “With two children at university, I don’t have a lot of spare money,” she says. Pam arranged with work to steward on the flights to and from Hungary, but to stay there for a week. “It took very little trouble to arrange and my cousin met me from the flight, ready and waiting to take me to her house for the week, so I didn’t even have to pay a hotel bill,” says Pam. The meeting with the surgeon, who spoke excellent English, lasted just under an hour and he arranged for the laser surgery to be timetabled for the next morning. “My cousin and I had arranged a cheap bed and breakfast in Sopron for that night as I didn’t need to stay in the hospital,” says Pam. Both had a great meal and strolled around the old Baroque town before settling down in their room in a quaint but spotless guesthouse. 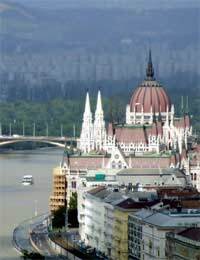 Pam had her treatment as a day patient and planned to return to Budapest later that night for the rest of her break at her cousin’s house. “I still was treated to a tour of the facilities though and if I ever had to have surgery that involved staying in hospital, I would definitely come back here,” says Pam. The hospital, which has 519 beds in total, has a maximum of 4 beds in each ward and hygiene is a major focus. “You can ask for a private room if you want and it is more like a hotel. I also saw that they clean each mattress at room changes – its not surprising that Hungary has a very low incidence of MRSA,” adds Pam.